One week has passed since my lovely Thai Girlfriend has flown to Europe to meet me. Last Wednesday I picked her up at the Brussels Airport and drove her home to my place. 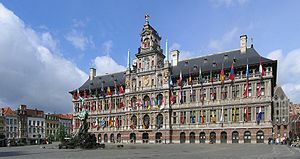 Since then we have been visiting Antwerp and the surrounding area. She has been making me wonderfully tasty Thai food and I have made some Belgian food for her. We really match together very well. Today we visited the “Kalmthoutse Heide“, which is a heath area in the north of Antwerpen, close to the Dutch border. We had a lovely walk together and despite the rain, she liked it very much. Tomorrow I have to be back in the office for one day, but I will rush home to sample the lunch made by my darling. The voters have rolled the dice and oh my Buddha, did they roll strange! Snake eyes for some, box-cars for others. In Antwerpen, the present multi-party (socialist-liberal-catholic-green) got beaten by the new NV-A (Flemish nationalist, somewhat right wing) party. The Open VLD (liberal party, somewhat conservative) got clobbered and scored even less than the PVDA+ (extreme left wing, former Stalinist –or was it Trotskisk– party). The CD&V (Catholic party) lost their Flemish nationalist wing to the NV-A: it seems their god is not as powerful as they imagine. The SP.A (Socialist party) did not do that bad, but in the eyes of many they lost heavily because they failed to win. The present (SP.A) mayor is ousted and will most likely be replaced by the NV-A’s president, Bart De Wever. The extreme right wing, some dare say, racist party Vlaams Belang, formerly the second largest party in Antwerpen, is reduced to its small hard-core membership of hate-everyone-who-does-not-have-white-skin-and-is-not-born-here nutcases. Now the funny thing is that the two parties, NV-A and SP.A, that fought a heavy handed campaign against each other are doomed to join hands in a coalition in order to get a majority in the city council. As SP.A and CD&V have made a pre-electoral cartel agreement to join their votes, that means that the “Winner” will have to allow all the “Loosers” to join in all this fun. It seems the NV-A’s promise “to rid the Metropolis of the Socialist scourge” will have achieved exactly the opposite. And they will receive those catholic chameleons as an added bonus. Interesting times ahead, for sure!